Disclaimer – Names may or may not need to be updated based on whether they see this and want me to remove them. LOL. I work at a company where part of our motto is “Making Health Count.” As much as I promote that for clients, I never really took making my own health count seriously. 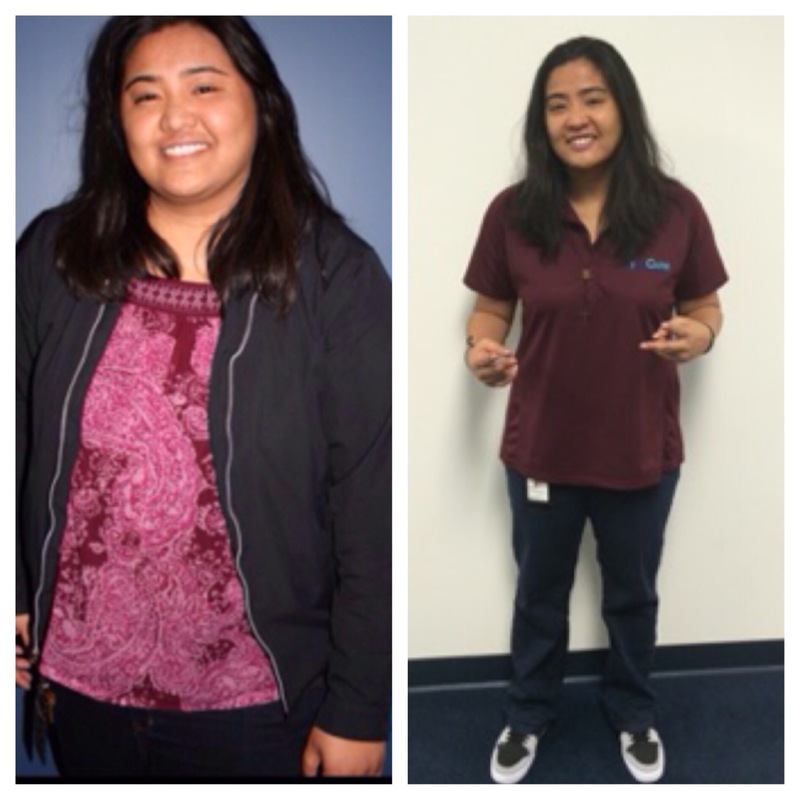 In 2012 (pictured on the left at 286lbs), our corporate trainer, Carmen held a Biggest Loser competition in the office. That opened my eyes to just how big of a number I weighed in at. Even after seeing that number, I didn’t take it too seriously. I came up with our team name: Team Can I Get Extra Ranch? Cuz you know, fatties always need extra ranch. LOL. I probably only contributed a 5lb loss. Sadly, our team fell short and only claimed the second place title but our team captain, Rocio went on to win the individual prize. I should have been inspired by how much drive she had to win, but nah, chicken wings and nachos still held priority in my life. At the beginning of 2013, I weighed in at about 275lbs. 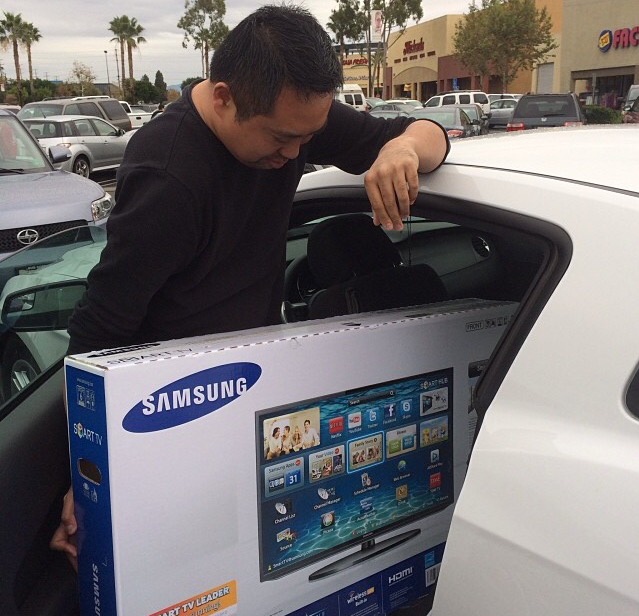 I jokingly told my work bff (who is now also one of my real life bffs), Abner that I would buy myself a big screen tv if I hit 250lb. You know what this ninja said after I told him? He goes, “What size screen? If you hit that mark, I gotchu, I’ll get it.” Snap! Let me tell you something about this dude…he pretty much signs off on all of my crazy ideas. If it doesn’t get us killed or thrown in jail, he’s in. He’s usually the one I drag out to Runyon Canyon or Sycamore Canyon super early in the morning to go hiking. He’s also the one I usually drag all over town to find $10 KBBQ spots…we’ll let that slide though. Anyhoo…at the end of 2013, around Thanksgiving…BOOM! See pic below. You the real MVP, Abskie! Yeah, I coulda and shoulda hit 250 sooner. I mean a free tv is a big deal, but again, I put other things on my list of priorities higher than my health. At the beginning of 2014, I started making smoothies for lunch instead of my usual Subway sandwiches. It was kind of a thing around here. A bunch of other people had the Nutribullet container at their desks. My buddy Sue even let me use her machine that she brought in from home. I think it’s when I asked Robin about what kind of juice she used for her smoothies that she recommended I watch Fat, Sick and Nearly Dead. Super eye-opening documentary. Check it out when y’all get the chance. Anyway…since then, Robin has been one of my biggest supporters in the office. Whether it’s a 5lb or a 50lb loss, she cheers me on congratulates me at every mark! Thanks, Robin. There are a lot of other people in the office who have been pretty supportive (my bad if I didn’t name y’all specifically). The big boss man himself, Dr. G., has commented on my transformation. I can’t confirm nor deny that I purposely walk by so he notices. LOL. The entire first floor (where my little part of the workplace is) throw out compliments pretty often. Some of them bring me various fruits and vegetables from their gardens ‘cuz they know I’m on a mission. Thanks, guys. LOL. I see the sixth floor peeps maybe once or twice a week and the shock factor and the “Oh snap, you’ve lost weight!” keeps me motivated. There’s even a group up there who keep having to give me a smaller sized work shirt. Thanks, buddies! I’m currently in a new contest with my boss Randy and some other people (to be blogged about when I win ‘cuz I’m gonna bring cake every day). Stuff like that keeps me on check. The making of ADC 2.0 and my quest for 185 has become a thing around here now. As much as this is my own personal journey, it wouldn’t be the same without these folks having my back.